The Times Up movement is resonating deeply with Timothée Chalamet. While celebrating his roles in Lady Bird and Call Me By Your Name Sunday night at the 2018 SAG Awards, the 22-year-old actor revealed that from his perspective, the dialogue is resonating with young men in and out of Hollywood. "Thank God it is. I think at the level of campus sexual assault, for people my age this was a dialogue that was somewhat already happening," he shared with E! News' Giuliana Rancic. "With the centralization, the Times Up movement and hopefully at award shows like this, conversation's getting out there." Timothée added, "Thank God. Equality at the work place. 50/50 by 20/20. These are messages getting out there." Recently, the Hollywood star made headlines after announcing that he will be donating his salary from Woody Allen's A Rainy Day in New York to three charities. "I don't want to profit from my work on the film, and to that end, I am going to donate my entire salary to three charities: Time's Up, The LGBT Center in New York and RAINN," he shared on Instagram. "I want to be worthy of standing shoulder to shoulder with the brave artists who are fighting for all people to be treated with the respect and dignity they deserve." While on Live From the Red Carpet, Timothée was joined by his Lady Bird co-star Saoirse Ronan. During the interview, Timothée couldn't help but give some extra love to his co-star for inspiring him on and off screen. "You're clearing your throat before I could even say your name," he joked to Saoirse. "I'm not even joking about that…"The heroes are Joaquin Phoenix, Heath Ledger and Saoirse and a lot of people here tonight. I'm going to try not to geek out too much." 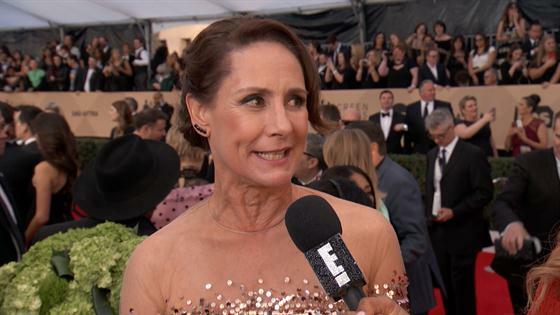 For complete coverage of the 2018 SAG Awards, watch E! News Monday, Jan. 22, at 7 and 11 p.m.!